Place paper baking cups in a 12-cup regular muffin pan. Preheat oven to 350 °F (325 °F for a dark or nonstick pan). In a large bowl, beat cupcake mix, eggs, beer and oil on low speed for 30 seconds, then on medium speed 2 minutes, scraping bowl occasionally. Fill each baking cup about 1/3 of the way full with batter (about 2 tablespoons). Reserve remaining batter. Squeeze filling pouch 20 times. Cut off corner of pouch and squeeze filling evenly into the center of each baking cup, being careful that the filling does not touch the sides of the cups. Fill each baking cup evenly with remaining batter, being sure to completely cover filling. Bake cupcakes 24 to 29 minutes or until the tops appear to be fully baked through. Remove cupcakes from oven and cool 20 minutes before removing from muffin pan. Frost with peanut butter and top with chopped pretzels, if desired. Maybe this will age me significantly (kind of like when I ran into someone the other day whom I used to babysit who’s now, like, an ADULT), but when I was little, I loved to watch the show, “MacGyver.” Nay, my life revolved around the show. I’d plan my day around it so nothing would get in the way of each episode. And every time I watched it, I was mesmerized equally by MacGyver’s skills and his mullet. Let’s be honest, both were pretty stunning. When I was in college, I found that the MacGyver mindset came in handy in the kitchen (as well as in other college-related things, like duct taping a chair back together or using a backpack as a pillow. These things happen). Because when you’ve got nothing else to work with besides the typical college student staples, you’ve got to be pretty crafty when it comes to making gourmet meals. Thankfully, the old noggin still remembers some of my culinary tricks. Like Boozy Chocolate-Vanilla Cupcakes. MacGyver and his mullet would be proud! 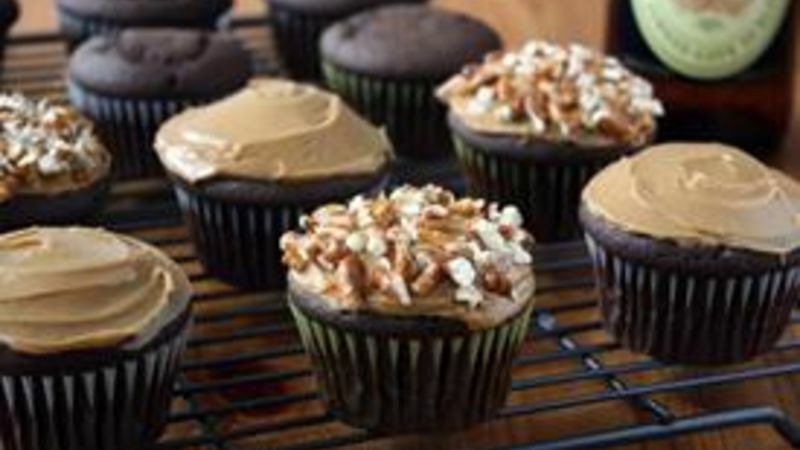 Maybe the words “leftover” and “booze” don’t register together in your college experience, but if you’ve got some extra beer around and a hankering for dessert, these cupcakes are your go-to treat. They’re stuffed with vanilla frosting, they taste like chocolaty beer (or is it beer-y chocolate?) and if you frost them with peanut butter (and pretzels, if you have those on hand) they taste like MAGIC. Sweet, satisfying MacGyver-ed magic. So there you have it! A delicious and easy recipe using leftover booze that goes above and beyond run-of-the-mill desserts. May the MacGyver force be with you this school year!